The stinkbug is not usually a pest we think about, but be on the lookout for these pests because by the time you see their injury, it could be too late. Why? We want to protect our seeds! This pest is relatively new to the U.S. and is mainly an issue in the South and Eastern cornbelt; however, they could be a concern in the Midwest. A warm winter does not necessarily predict the invasion of the pest, but it can put fields at higher risk. Fields that are late planted, have cool weather that delay maturity, or vulnerable to pests could also be at risk. Heavy populations are possible and they are great hitchhikers. There are many different kinds of stinkbugs and they can be pests of many different crops as well as fruits and vegetables. They have round, oval bodies with a shield shaped triangle on their backs with 5 segmented antennae. One stinkbug that we are especially worried about is the Brown Marmorated Stink Bug, which has white bands on it's antennae as well as other distinguishing characteristics. This pest arrived in the U.S. in 1998 and its populations are building. As they get hungry, we fear they will move from orchards to corn and soybeans. Stinkbugs have piercing and sucking mouth parts that can poke through husks or pods. This causes seeds to be shriveled, blasted, or flat. We especially worry about injury on soybeans. Most insecticides are labeled for stinkbug control. 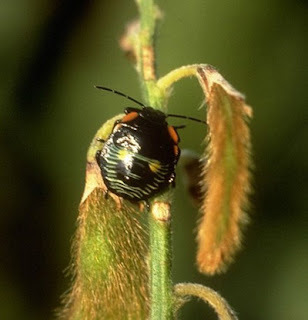 Adult stinkbugs can tolerate more insecticide, but younger stinkbugs, such as nymphs, are easier to kill. Scout several areas (10) throughout the soybean field with a sweep net or visually, then average the number of stinkbugs that you find. Populations will be higher at dusk or dawn. If you see an average of 4 or more adults/nymphs after R2 growth stages or mid August, you may consider an insecticide treatment. The threshold is lower for seed fields. To find out more information, you can listen to Stephanie Porter's at Podcast, Stinkbugs: The Pest To Watch Out for This Year. For more information, contact Kelly Estes, University of Illinois Agricultural Pest Survey Coordinator.